Like many academics, I came into the profession full of a righteous sense of purpose, sure that I would produce work that would, if not change the world, at least change a few minds. I think I have managed to do that all right but in the process I have changed my own mind several times about why we do what we do and to what end. Social change, per se, is such a hard mission and transformation almost never happens all at once. And so, my more modest mission has become to unlearn all that I have been taught or at least to unlearn my own training, in order to be open to new knowledge that comes from unexpected sources. As academics receive training to think, write and teach, we also start thinking in ways that tend to reinvest in dominant ideologies and we often lose faith in subversive ones. We literally talk ourselves out of alternative political imaginaries by being so eloquent and persuasive about the totality of hegemony. And by the time our training is complete, many of us are more interested in gaining the recognition of our peers (by detailing the topography of the dominant) than in investing in the chimera of change and transformation. Michel Foucault’s advocacy, therefore, for subjugated knowledge as ‘disqualified knowledge,’ knowledge that lacks legitimacy and that cannot be turned into a ‘science,’ becomes more and more attractive as universities become more invested in marketing knowledge, in knowledge markets and in knowledge for profit. When we hold something back from the rigid protocols of our disciplines, when we let loose on a thought, a whim, a fancy, we leave the realm of rigor altogether and begin an intellectual trip into the utopian, the field of the possible if not probable. Like other scholars of the counter-hegemonic—thinkers like J.K. Gibson- Graham, James C. Scott, Dean Spade, Rod Ferguson, José E. Muñoz come to mind—my desire to deconstruct dominant forms has waned over time and I find myself wanting to pay careful attention to the subversive, utopian and often queer and/or anarchist forms of cultural production and critique that emerge from the wreckage of casino capitalism and its attendant militarized forms. This conference, organized by Kerry H. Robinson and Cristyn Davies, Queer and Subjugated Knowledges: Generating Subversive Imaginaries was a real treat in that people rose so magnificently to the challenge of thinking outside of the frozen logics of us and them, power and the dispossessed, and for two days, we entered the realm of the queerly utopian to ponder the ‘what ifs’ of subversive imaginaries. It was truly an honor to engage and be engaged by such a magnificent group of thinkers, more importantly by such an amazing group of subversive scholars who have not yet abandoned the notion of ‘subversion’ to its deconstructive fate but are still willing to skip along with it wherever it may lead. I was lucky to skip a little while beside them and like them to head in a queerly utopian direction without ever needing actually to arrive. This book, Queer and Subjugated Knowledges: Generating Subversive Imaginaries, edited by Kerry H. Robinson and Cristyn Davies, is the third book in the series Rethinking research and professional practices in terms of relationality, subjectivity and power. It follows Sheridan Linnell’s book, Art Psychotherapy and Narrative Therapy: An Account of Practitioner Research, and Cath Laws’ Poststructuralism at Work with Marginalised Children. Queer and Subjugated Knowledges: Generating Subversive Imaginaries is a book that takes up the challenge of this series to find new ways of thinking and being. It opens up the space of queer knowledge as a dynamic and generative space, and reconceptualizes everyday interactions through the play of and with subversive imaginaries. It works to enable the reader to imagine things differently, not in terms of binaries which give dominance and credibility to the ‘mainstream,’ and abnormality or, at best, difference, or indifference, to others, but of a celebratory and defiant refusal of the hegemonic. Drawing on the work of cultural theorist Judith Jack Halberstam, the papers in this book develop a counter-hegemonic research practice through creative engagement with subjugated lives. This is an exciting work that responds to Halberstam’s call to engage in alternative imaginings in each of the contributors’ disciplinary areas: Education, Rhetoric and Cultural Studies, Gender Studies, Performance Studies, Television and Media Studies, Animation, Sociology, History, Social Policy, Childhood Studies and Cultural Geography. This is a book about new ways of addressing justice and injustice, not from the viewpoints of those who judge others and find them wanting, but from an ethical space of openness and imaginative shifts. In such an ethics, the realization of one’s identity, through establishing the moral values with which to judge oneself and others, is not the point. The point is to become different from oneself, to evolve creatively in the space that is opened up. Each book in this series focuses on the relations between individual subjects and the social, discursive and spatial relations within which they are produced, and produce themselves, as subjects. Rather than being locked into liberal humanism’s relentless individualizing and pathologizing and judgementalism, poststructuralist theory seeks the ways in which we might break loose from the already known, habitual practices through which the familiar world is produced. It opens up the ethical possibility that we might produce difference in ourselves rather than sameness, and that we might open ourselves up to new knowledges and practices. From a poststructuralist perspective our individual agency is an effect of the ways in which we are constituted; it was not through our own agency that we were made what we are, but through our location within particular histories, relations and cultural practices. We are generally unaware of the way discourse works through us to create us in predictable, historically specific ways. Poststructuralist theory suggests it is the very conceptualization of the individual as primary, and as originary, that blocks this awareness. What Foucault rejects in phenomenology is the way it makes the individual subject its foundation, and sets out to “recapture the meaning of everyday experience in order to rediscover the sense in which the subject that I am is indeed responsible, in its transcendental functions, for founding that experience together with its meanings” (Foucault, 2000, p. 241). Foucault sees his own work, in marked contrast, as using experience to wrench “the subject from itself,” to find ways to make the subject “no longer itself” (2000, p. 241). He wants to annihilate the subject of phenomenology, the subject that endlessly repeats itself, that understands itself as its own origin—to dissolve it, through what he calls a “project of desubjectification” (2000, p. 241; see also Davies, 2010). Writing against the grain of the already-known is central to Foucault’s radical project of opening up the not-yet-known. He wants to write his way into new understandings of how we become, in one historical period or another, subjects. His books are, he says, “experiences aimed at pulling myself free of myself, at preventing me from being the same” (2000, p. 242). v It is the possibility of this kind of difference, of radical social change, that is the driving force of his work. He seeks to open up an experience of modernity that generates a transformative effect. The work that has grown out of Foucault’s program of writing, and the writing of other poststructuralist scholars, has also had a second and more recent driving force. That is the advent of the intensified individualism of neoliberal governmentality. Capitalism, according to Deleuze and Guattari (1987), is schizophrenic. It needs to control its labour force in order to extract maximum productivity from it, while at the same time enhancing the production of new and creative ideas. It convinces individuals that they are free at the same time as it shapes them to be whatever capital thinks it wants. This madness of the modern capitalist state has had devastating effects on individuals and on the professions. The program of desubjectification is thus also aimed at the hyper-individualism of modern capitalism, that produces sameness and repetition under the banner of freedom. a book that functions as an experience, for its writer and reader alike, much more than as the establishment of a historical truth…For one to be able to have that experience through the book, what it says and does need to be true in terms of academic, historically verifiable truth. It can’t exactly be a novel. Yet the essential thing…[lies] in the experience that the book makes possible…[This] book makes use of true documents, but in such a way that through them it is possible not only to arrive at an establishment of truth but also to experience something that permits a change, a transformation of the relationship we have with ourselves and with the world…in short, a transformation of the relationship we have with knowledge…[That transformation] is not just mine but can have a certain value, a certain accessibility for others, so that the experience is available for others to have. (Foucault, 2000, pp. 243–244). Through coming to know differently, as writer, and as reader, Foucault shows how we might detach ourselves from the habitual repetitions of thought and practice through which we previously accomplished ourselves as predictable maintainers of the status quo. The individual is thus for Foucault, not the end-point of a process of subjectification, but the potential sticking point, the place where thought gets stuck. Writing is the medium through which both thought and the writer/reader can be changed. 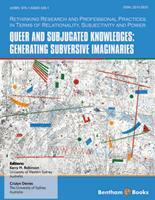 Queer and Subjugated Knowledges: Generating Subversive Imaginaries is just such an experience/experiment book. It experiments with queer experiences and texts to write a transformative book, a book through which the authors transform both thought and themselves, and potentially their readers. They have engaged in an experience/experiment in writing that taps into a change already underway, taking it further, participating, in doing so, in a transformation of the field that they write about. They do not set out to produce the ‘truth’ about the nature of queerness, as if queer subjects were objects capable of being studied. Rather they open up new ways of imagining subjecthood itself. The book develops an ethical stance that is of profound importance. We are living in a time when re-thinking ethics is an urgent task (Wyatt and Davies, 2011). This book makes a significant contribution to that task. Foucault (2000) makes an important distinction between two kinds of knowledge: savoir and connaissance. Savoir involves doing work in order to know differently, and in the process, being modified through what one comes to know. Connaissance makes possible the knowledge of objects, that is, it makes those objects intelligible, while leaving the subject, the determinate knower, untouched. This book generates savoir—a knowledge of experimenting and experiencing life differently.